The Londa Beach Hotel has teamed up with “Oenou Yi” winery for an eclectic wine-pairing dinner on February 8th. The new contemporary winery of Oenou Yi – Ktima Vassiliades reflects the art and vision of the Vassiliades family, as well as Omodos village’s wine-making culture. With exuberant expertise and ‘meraki’ (Greek for the heart, soul, creativity and zest blended into your endeavour), Oenou Yi – Ktima Vassiliades contributes to the history and continuity of the Cyprus wine production. The glorious heritage of the vineyards is what inspired Londa’s Executive Chef, Vassos Michael, to craft a delectable menu around a selection of Oenou Yi – Ktima Vassiliades’ fine wines for the wine-pairing event. Starting at 20.30 with a cocktail reception at Caprice’s Lounge Bar, guests can sample the ‘White Dry 2017’ an aromatic Xynisteri variety ‘secret blend’. At 21.00 sharp, a culinary journey will unfold with a four-course dinner! The second course, which will be paired with a ‘Rosé 2017’ is a risotto with prosciutto, flavored with truffle oil, garnished with parmesan. Following a 24-hour extraction process using the saignée method, the ‘Rosé 2017’ stems from grapes of the international Shiraz variety. For the main course, guests will relish a fillet of veal wrapped with a polenta and fresh herb mix, grilled oyster mushrooms, baby carrots glacées, broccoli, and a potato and spinach cake served with red wine sauce. This dish will be paired with ‘Geroklima’ (Greek for old, strong vine). An exceptional wine, produced from the indigenous variety “Maratheftiko”, the unique ‘Geroklima 2016’ takes its inevitable final form following its maturation in new, oak barrels. A delightful sweet pause will follow with a decadent Trilogy of Chocolate, which will pair wonderfully with the evocative aroma of ‘Xynisteri Malaga 2016’, a sweet wine with great purity and elegance on the palate. What’s more, a selection of aromatic coffee, zivania and sweet dessert wine, Commandaria will wrap up the Sip and Taste journey. During the evening, Ms. Katerina Mylona, Oenou Yi – Ktima Vassiliades’ Senior Oenologist, will elaborate further on the wine selection on offer. 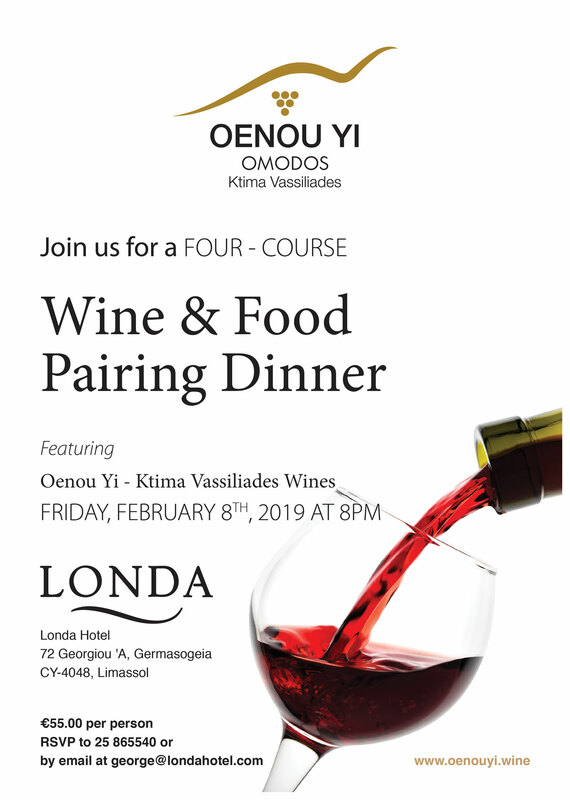 A fine selection of Oenou Yi – Ktima Vassiliades’ wines will be featured on Londa’s 2019 Wine Menu. By signing up, you agree with the storage and handling of your data by this website and you will be receiving our newsletters. You can withdraw your consent by contacting us.